The Next Exciting Step in the interim era! 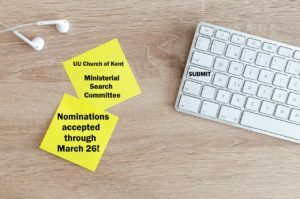 It’s time to create a Ministerial Search Committee that will be presenting a candidate for settled minister to you in just one year. play well with others! The work of the MSC keeps them in close contact for many, many hours and they will be successful by having the ability to share their work with each other, delegate, and listen well. It’s imperative that they get along in small group work. Comments are welcome, but the assumption is that you trust each person named to represent the entire congregation democratically, care deeply about the future of the church, and be able to work well as part of a small group. Our elected Board of Trustees and Leadership Development Committee will consider all nominees as they assemble a slate for congregational approval at a special meeting in late April. That’s right, just a month from now you will be voting on the MSC slate! Submit your nominations through the form below. It is the right and responsibility of the membership to nominate and approve the MSC. It is the responsibility of the Board of Trustees and the Leadership Development Committee to assemble a slate for your approval. Each person on the slate will have been interviewed and have an understanding of the magnitude of their commitment. Active members will vote. Active members are eligible to serve on the MSC. They will elect their own chair and are expected to conduct the search in accordance with UUA guidelines. UUA Guidelines specify absolute dates and key points in the process and it will be the MSCs responsibility to stay on schedule.